Our Daikin-Intergas Hybrid is an all-round solution for heating and hot water. This unique heating system consists of a Daikin heat pump and outdoor unit, and an Intergas HE boiler. As a hybrid, it provides optimal heating and unrivalled quantities of hot water and comfort all year round, even when outdoor temperatures dip below freezing. 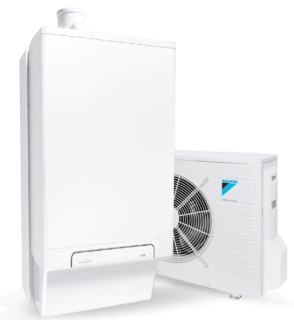 This all-round home solution for heating, cooling and hot water combines the Daikin Altherma air-to-water heat pump with the Intergas Combi Compact HReco 36 boiler. It’s the ideal combination for reducing CO2 emissions, energy consumption and your bills. What’s more, the Daikin Altherma air-to-water heat pump uses renewable energy; it’s free and freely available. How? It extracts as much heat as possible from the outside air. Our Combi Compact HReco hybrid uses a unique dual, aluminium, two-in-one heat exchanger. Its patented design ensures minimal heat loss and optimal heat transfer. Both central heating water and cold tap water pass directly through the heat exchanger cooling the flue gases and recovering as much heat as possible for reuse. This technology does away with the need for a three-way valve.